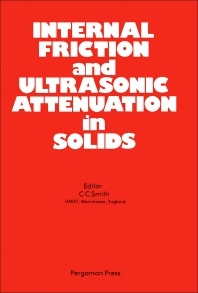 Internal Friction and Ultrasonic Attenuation in Solids contains the proceedings of the Third European Conference on Internal Friction and Ultrasonic Attenuation in Solids, held at the University of Manchester in England on July 18-20, 1980. The papers explore the principles of internal friction and ultrasonic attenuation in solids such as pure metals and their alloys, ceramics, glasses, and polymers. Structural features such as point defects, dislocations, interfaces, and second phases in solids are discussed, together with the processes by which these features contribute to energy dissipation. Topics covered range from point defect interactions to the establishment of high damping capacity materials for absorption of noise and vibration. This book is comprised of 65 chapters and begins with a brief review of the internal friction peaks observed in face-centered cubic, body-centered cubic, and hexagonal metals due to dislocation relaxation processes. Subsequent chapters focus on the internal friction of cold-worked single crystals of high-purity copper; evidence of Peierls Nabarro stress from microdeformation and attenuation experiments; effects of cyclic deformation and irradiation at low temperature on the internal friction of pure aluminum; and internal friction of high-purity magnesium after plastic deformation. The peaking effect in copper and silver is also analyzed, along with Zener relaxation and dislocation damping. The final chapter is devoted to anelastic behavior of ice at low temperature due to quenched point defects. This monograph will be a valuable resource for metallurgists, physicists, and mechanical engineers. A New Model for the "Peaking Effect"
Interpretation of the "Peaking Effect"